Wow that is gorgeous! That is exactly the color what I would want. Can't wait to see it set. I had often wondered about those stones as well. I think I may try one out! How long does it take to get to the states? Is there customs fees involved? I think it was 2 or 3 weeks? I've ordered jewelry from India before, and it's always right in that range. No customs fees. 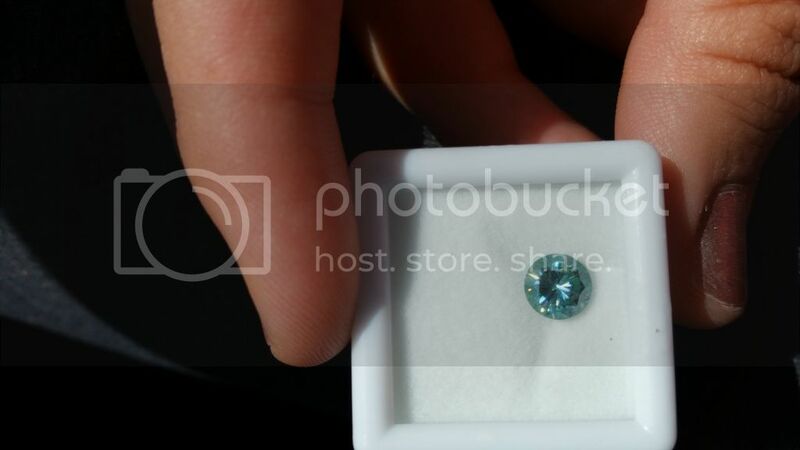 You can really see the moodiness next to the 1 carat blue. 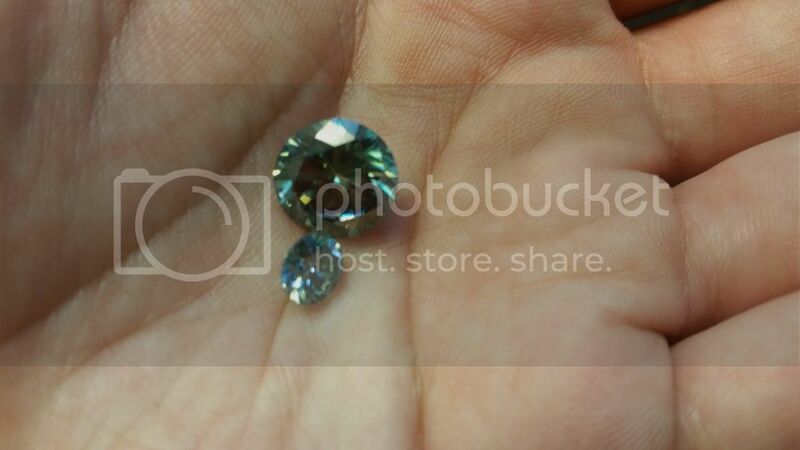 Overall, I would never order these moissanite as a stand-in for actual moissanite. The cut and color is pretty random. But I'd happily use them as a stand-in for a semi-precious stone. They're deliciously sparkly. Apologies for the giant pictures! I'm not sure how to resize. I also got 2 stones on ebay after reading all the posts here. One of the stones I like, and the other I don't like very much. I ordered a 9.90mm black moissy from them for .99 that arrived this week. I had assumed it would be jet black (like onyx or spinel) but it was more like dark slate...not a bad thing, but not what I expected, not having seen a black moissanite before. 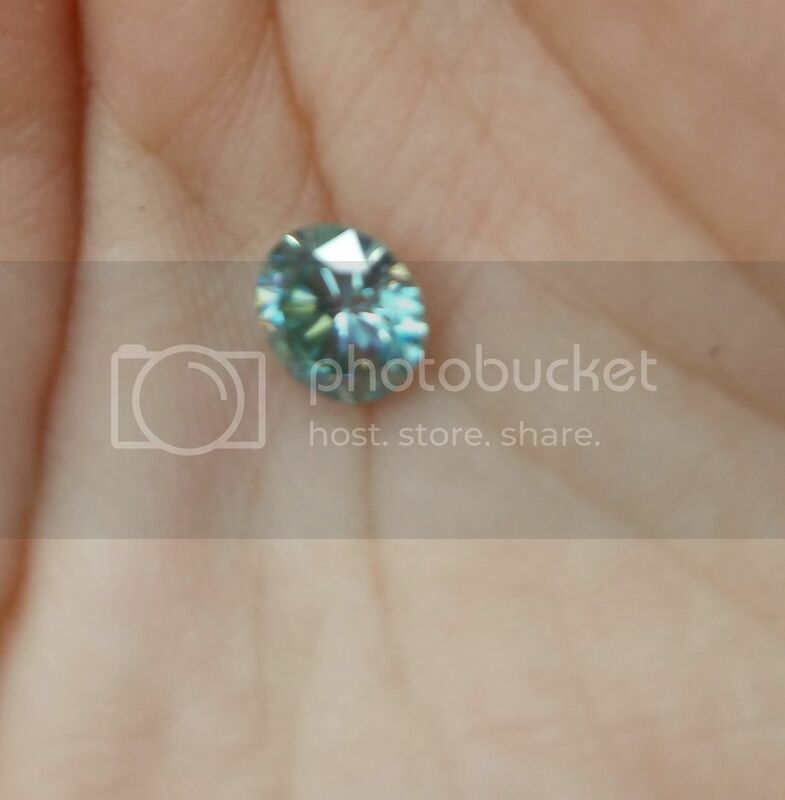 Overall, I was happy with the free shipping and getting a stone for just under a $1! I will probably have it set in silver as a fun ring. I'd post a pic, but can't figure out how to do it on this forum!! I ordered several stones. I mounted my favorite Indian Moissy in diamond halo ring that I got a super deal on from local CL seller. Second video was taken at night indoors under incandescent lighting. I put some of the "whiter" off white stones in vintage rings to re-sell and returned the rest (seller wasn't happy I didn't want to accept partial refund and keep stones). 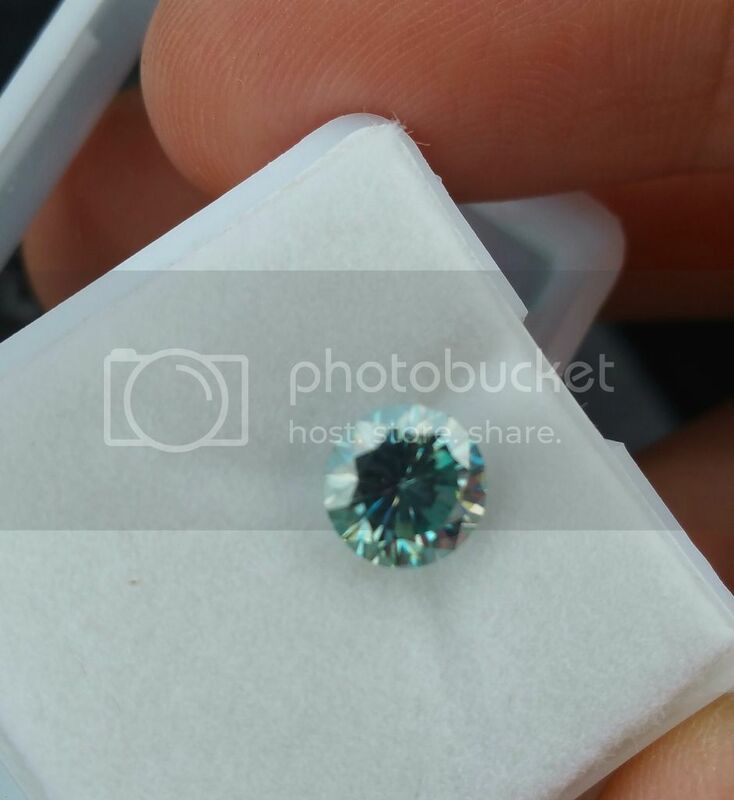 I ordered a matched pair of blue (earrings maybe) and have a smaller VS1 blue stone in an vintage Artcarved setting that doesn't return light well, so may replace that with 4 mm round .25 ct VS2 H color diamond to re-sell. My original plan was to sell off some of my jewelry and other items on eBay to raise funds for F or G color 1 - 1.5 ct VS2 or better clarity diamond for new white gold E/Wedding ring (to match hubby's WG band with princess diamonds). But now I am thinking of trying AG or C & C F One stone instead after researching and reading several threads here and on TFL. I have watched numerous videos of the different cuts as well. I ordered H & A AG and am anxiously awaiting it's arrival! Wondering if I should order C & C F One stones to compare and return stones I don't like. wow beautiful. Makes me want to replace my green tourmaline ring with a green moissy cause the tourmaline is so scratchy. I love green stones. I'm not seeing the rainbow sparkle everyone talks about. Is that more for the White stones and not the coloured ones? Have you tried natural outdoor lighting? Sherman, where did you end up getting your colored Moissanite set? Are you pleased with the results? I bought one. I wanted a light brown its more yellow than brown but it was less than 30 dollars. I'm a professional musician and purchase them on a regular basis. They're just as high a quality as Charles and Colvert who has a 1000% mark up on the same item/items. For what C&C charges, ie, 14 carat gold settings with a 4.5 carat Moissanite brilliant round gem (around $5,000 at least) can ordered from India for $500-$600. I do it all the time. The only negatives I can state with an India purchase is the loooooong wait times getting through theirs and everyone else's customs, and their seemingly inability to produce totally white gems. Their gems are usually off white hinting at a golden or yellow glint when in sunlight, which is just fine because the refraction is so beautiful that diamonds look like rock salt by comparison. However, when ordering from India and you want a gold rather than a silver setting be certain to specify it in your order. I guarantee the craftsmanship will be superlative but the wait will be long. You'll still come out ahead because you'll be saving thousands of dollars for the same quality (or better) craftsmanship and product than ordering from the skyjacked markets here. If you don't mind waiting several weeks to a month for your item then India is the way to go. They're honest, skilled and hungry, and have no desire to lose American customers, so have no compunction dealing with their products and markets because satisfaction is guaranteed. 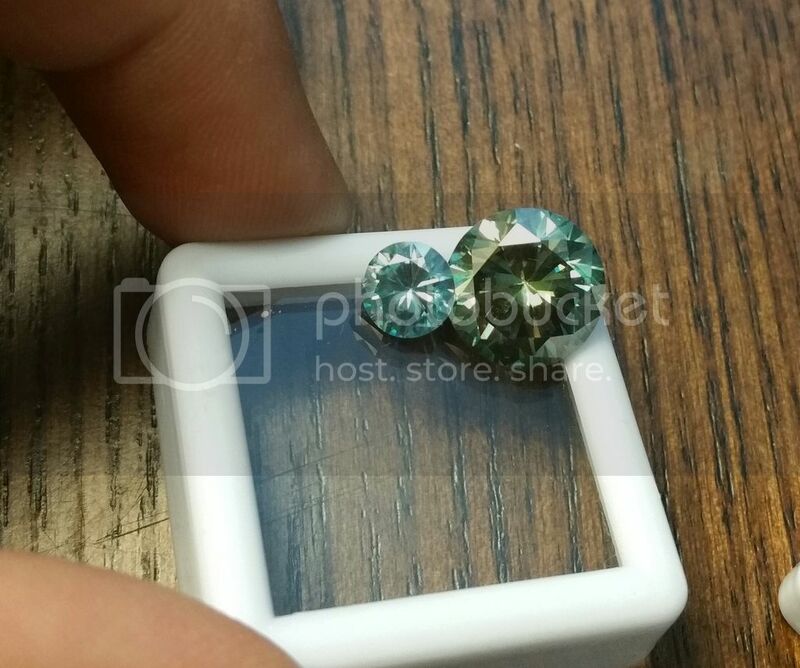 I received a large 9 MM supposedly H I color (not) OEC cut stone from Indian supplier several months ago. I ended up with refund and didn't have to ship it back. 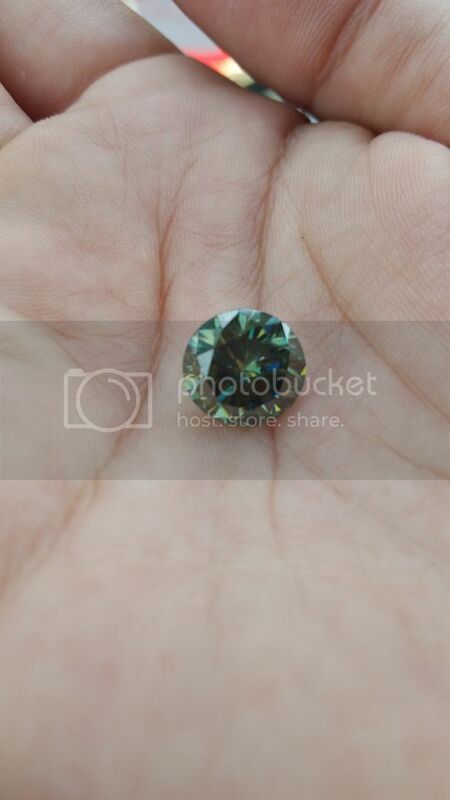 I may take it to Downtown Jewelry Mart gemstone cutter and see if something can be done to fix the cut.